Competition time: Submit a review and enter a drawing for an Amazon Kindle Fire tablet! To kick off the holiday season, we would like to announce a little competition for all you researchers! Review an article in any ScienceOpen Collection before the end of December and we will enter you into a prize drawing for an Amazon Kindle Fire tablet. To enter, all you need to do is log in to ScienceOpen, explore our collections and review any article in your field. This video will help you in getting started and here you can read more about peer review on ScienceOpen. Reviewing requires and ORCID and 5 publications. If you do not meet these requirements, but would still like to review a paper, contact us. We are looking forward to your reviews and will announce the winner on January 2nd, 2018. Choosing to review one of the articles in our advent calendar would be a great way to show your appreciation to those researchers who have dedicated their time to providing a valuable research resource to their communities. Good luck! Tis the season, after all! Did you know that we have more than 1.3 million preprints on ScienceOpen? Preprints are first-draft research manuscripts, and have been around for as long as the Web has existed. Some researchers, like physicists, have been posting them online for almost 3 decades, taking advantage of the rapid communication capabilities that the internet enabled. Now, researchers in the Life Sciences and other fields are catching up, with platforms like bioRxiv, the Center for Open Science, as well as the ASAPbio initiative. Preprint or not preprint? Simple! At ScienceOpen, we fully support research communities and their adoption of preprints. To make discovering them even easier, we have recently added a preprint filter to our search engine. ScienceOpen currently has 35 million article records as part of our expanding citation network. We are growing each day as new content is integrated from our publishing partners, and sources like PubMed, CrossRef, ORCID and arXiv. The ScienceOpen discovery and collaboration environment offers state-of-the-art technological infrastructure allowing publishers to create an entirely new kind of showcase for their journals. Our Featured Collections help users to drill down and explore content with over 20 filters and sorting options, combining depth and precision to make discovery more efficient. Featured Collections deliver great benefits to publishers in terms of content visibility and discoverability. We are therefore happy to announce that we have now hit the 100 Featured Collections milestone! 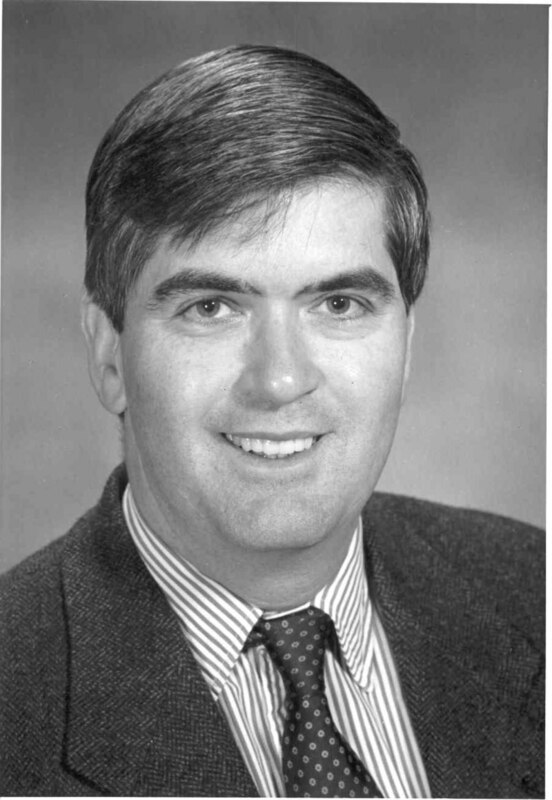 Professor George Perry is the Dean of the College of Sciences at the University of Texas in San Antonio. He is recognised as a world expert in the field of Alzheimer’s disease. Today, we spoke with Prof. Perry about his research, including his new ScienceOpen collection. Hi Prof. Perry! You are recognised as one of the 100 top scientists in Neuroscience and Behaviour, and have incredibly amassed more than 1300 research publications to date! What’s the secret to your success? 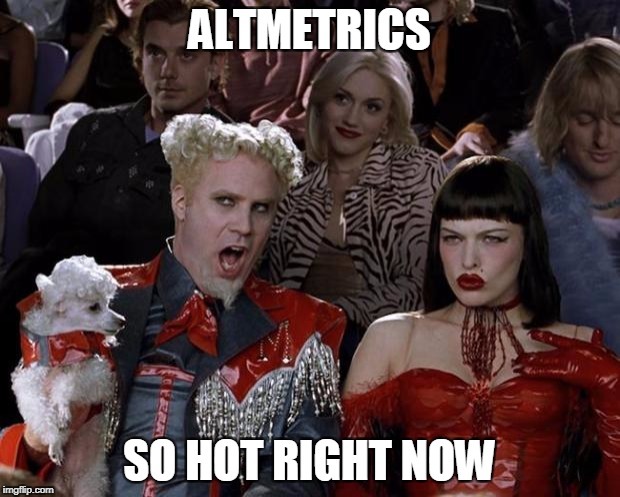 Persistence and focus on collecting and publishing highly useful data and insights. Do you ever find it difficult maintaining your public profile with so many publications? 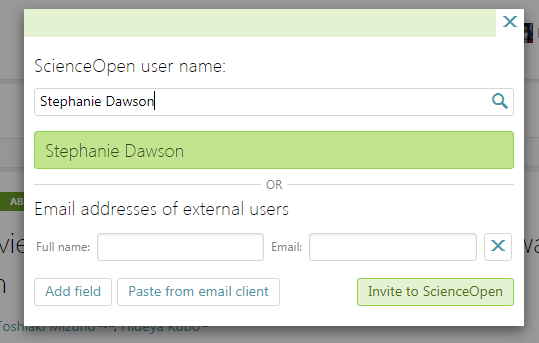 How did you find the ORCID integration at ScienceOpen? Maintaining numerous profiles as up-to-date requires constant monitoring. Linking datasets with ORCID does assist. Your research focusses on the processes leading to neuronal damage. What have been your key discoveries to date? Primarily, establishing oxidative stress in Alzheimer’s disease. Second, new insights regarding the cell biology of Alzheimer’s disease. Your ScienceOpen collection is on alternative approaches to Alzheimer’s disease. What is the ‘alternative’ in this case, and why is this so important? It is the alternative to the amyloid cascade, which dominates our field. The collection presents a biological view of Alzheimer’s disease. What do you hope to achieve with your ScienceOpen collection? And how can we help you with this? The collection provides a group of papers that illuminates an alternative to amyloid as the cause of Alzheimer’s disease. I use it when communicating with others about weakness and alternatives, and to demonstrate that the amyloid cascade has been questioned for over two decades. Thank you for your time, Prof. Perry. It has been great to learn from your insight and experience! At ScienceOpen, we are constantly evolving to match the needs and demands of the global research community. 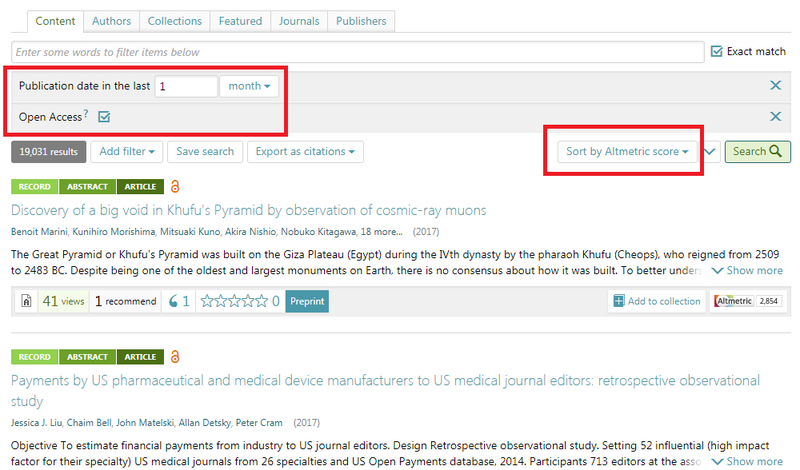 Already this week, we announced a new feature for users to directly import articles from PubMed, DOAJ, or Crossref, semantically integrate them into our network, and boost your open citation counts. 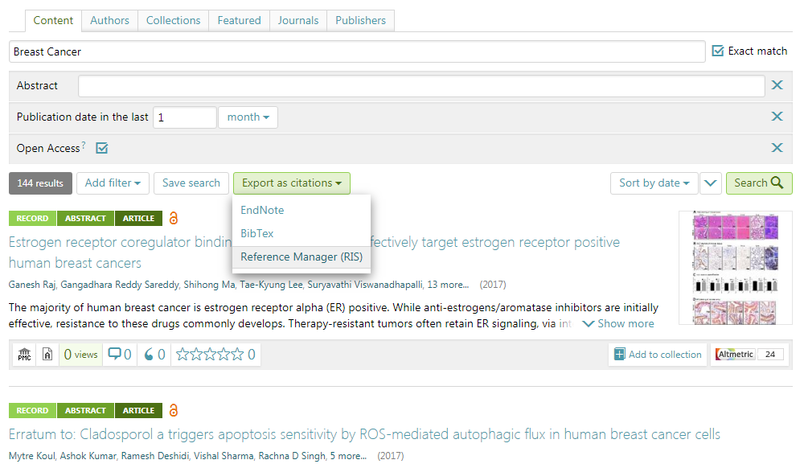 Now, ScienceOpen provides all users with is the ability to export article citation lists based on search criteria. This is a unique service we provide, and saves researchers the laborious and tedious task of individually assembling reference databases. Like all other services for researchers at ScienceOpen, this is, of course, free! The export citation button now appears on every article record in our database (source). 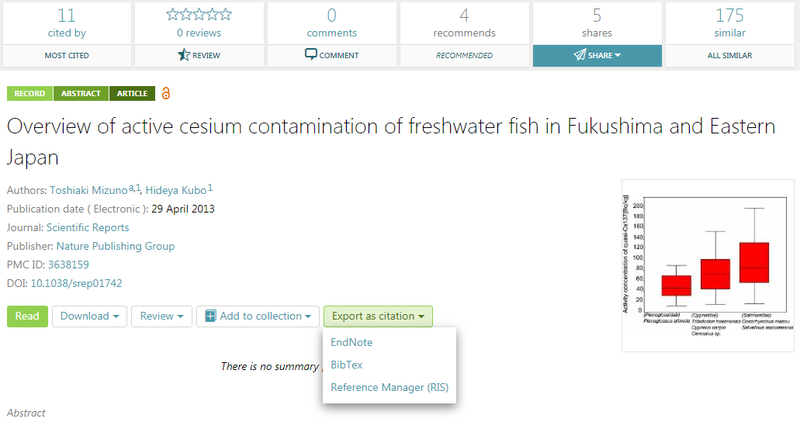 Found an article you like on ScienceOpen and want to export it to your reference manager? Easy! On each article page, across 33 million records, there is now an ‘Export citation’ button. You can download them in either BibTex, Endnote, or RIS format, making them compatible with almost any modern reference manager.